Some critics are lambasting President Obama for record deficits. This is not a productive line of attack, largely because it puts the focus on the wrong variable. America’s fiscal problem is excessive government spending, and deficits are merely a symptom of that underlying disease. Moreover, if deficits are perceived as the problem, that means both spending restraint and higher taxes are solutions. The political class, needless to say, will choose the latter approach 99 percent of the time. A higher tax burden, however, simply means that debt-financed spending is replaced by tax-financed spending, which is akin to jumping out of the frying pan and into the fire, or vice-versa. In addition to being theoretically misguided, critics sometimes blame Obama for things that are not his fault. Listening to a talk radio program yesterday, the host asserted that Obama tripled the budget deficit in his first year. This assertion is understandable, since the deficit jumped from about $450 billion in 2008 to $1.4 trillion in 2009. As this chart illustrates, with the Bush years in green, it appears as if Obama’s policies have led to an explosion of debt. But there is one rather important detail that makes a big difference. 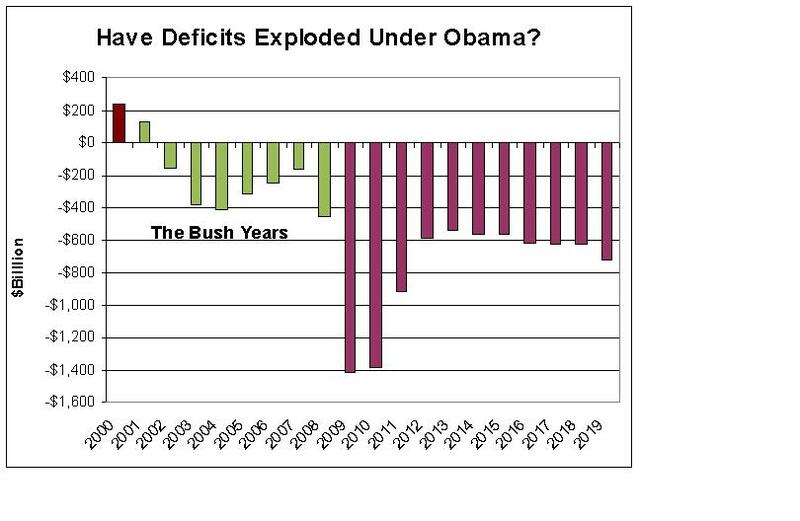 The chart is based on the assumption that the current administration should be blamed for the 2009 fiscal year. While this make sense to a casual observer, it is largely untrue. The 2009 fiscal year began October 1, 2008, nearly four months before Obama took office. The budget for the entire fiscal year was largely set in place while Bush was in the White House. So is we update the chart to show the Bush fiscal years in green, we can see that Obama is partly right in claiming that he inherited a mess (though Obama actually deserves a small share of the blame for Bush’s last deficit since earlier this year he pushed through both an “omnibus” spending bill and the so-called stimulus bill that increased FY2009 spending). It should go without saying that this post is not an argument for Obama’s fiscal policy. The current President promised change, but he is continuing the wasteful and profligate policies of his big-spending predecessor. That is where critics should be focusing their attention.